Abstract: Opioid-induced constipation (OIC) imposes a significant burden for patients taking pain medications, often resulting in decreased quality of life. Treatment of OIC with traditional medications for functional constipation can be incompletely effective, leading to nonadherence with opioid treatment and undertreated pain. An emerging class of medications that counteract the adverse effects of opioids in the gastrointestinal tract while preserving central nervous system-based pain relief may represent a paradigm shift in the prevention and treatment of OIC. One of these medications, naloxegol, is a once-daily, oral opioid antagonist that is effective, well-tolerated, and approved for treatment of OIC in patients with noncancer pain. More studies are needed to demonstrate this same utility in patients with cancer-related pain. As a result of the prevalence and severity of OIC, many chronic pain patients are often forced to choose between adequate pain relief and comfortable bowel function. Multiple studies illustrate this dilemma.4,8,11 Studies have found 8%–33% of patients report altering or stopping their opioid use due to OIC, thereby severely limiting the clinical benefit of opioids.8,11 In the PROBE study,4 92% of patients who altered their opioid regimen due to OIC subsequently experienced increased pain, and 86% of those experiencing increased pain reported that it moderately to greatly reduced their quality of life and activities of daily living. Not only does OIC impact patients’ quality of life, it also results in increased health care costs. Compared to patients who did not alter their opioid therapy, those who modified their regimen due to OIC had greater health care resource use as evidenced by increased number of surgeries, ER visits, and hospitalizations in the previous 6 months due to pain (odds ratio [OR] of 3.72 for having surgery, OR of 1.88 for ER visits, and OR of 2.47 for hospitalization). They also had more pain-related and OIC-related drug and health care provider out-of-pocket costs.12 Another cost analysis in Sweden showed an increased burden of cost for patients with severe OIC. Severe OIC was associated with increased direct and indirect costs when compared to patients with no or mild constipation. Sick leave was found to be the largest cost. Use of outpatient facilities and total medication costs were also increased. Depending on the patient’s work status, the difference in monthly total cost could be as much as EUR 1,525 for those with severe OIC versus EUR 1,034 for those without OIC.13 These quality of life and health care cost data suggest a significant unmet need in the diagnosis and treatment of OIC. PAMORAs are a newer class of medications that are unable to cross the blood–brain barrier allowing them to counteract opioids’ GI side effects while preserving CNS-mediated analgesia. PAMORAs include methylnaltrexone, alvimopan, and naloxegol. Methylnatrexone has been shown to be superior to placebo for treatment of OIC in patients who failed traditional management.15,17 Its limitations include subcutaneous administration and restricted indication, ie, use only in patients with advanced disease.1 Alvimopan is available in oral formulation, but is restricted to short-term use for postoperative ileus as clinical trials showed increased incidence of myocardial infarction with long-term use.1,18 Naloxegol, (Movantik™, AstraZeneca, Cambridge, England) is an oral, once-daily PAMORA currently approved by the US Food and Drug Administration (FDA) for treatment of OIC in noncancer pain. 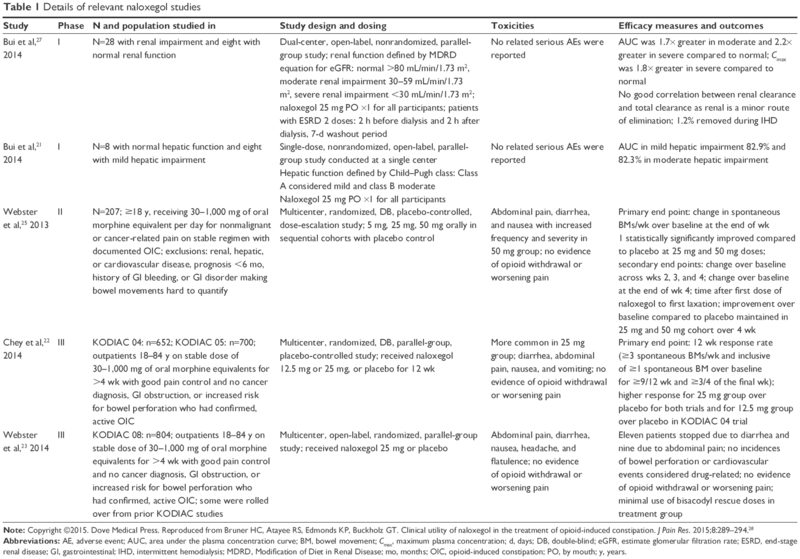 Key Phase I, II, and III trials evaluating pharmacokinetics, efficacy, and safety of naloxegol are summarized in Table 1. Two of the Phase III trials compared response rates between placebo and naloxegol doses of 12.5 mg daily and 25 mg daily. Response was defined as at least three spontaneous bowel movements per week that was at least 1 greater than baseline. These changes needed to be seen in at least 9 of the 12 trial weeks and at least 3 of the last 4 weeks of the trial. The KODIAC 04 trial found significant response at both doses, while the KODIAC 05 trial found significant response at the 25 mg dose. Abbreviations: AE, adverse event; AUC, area under the plasma concentration curve; BM, bowel movement; Cmax, maximum plasma concentration; d, days; DB, double-blind; eGFR, estimate glomerular filtration rate; ESRD, end-stage renal disease; GI, gastrointestinal; IHD, intermittent hemodialysis; MDRD, Modification of Diet in Renal Disease; mo, months; OIC, opioid-induced constipation; PO, by mouth; y, years. Unfortunately, clinical trials of naloxegol have included relatively little patient-oriented outcomes data. Webster et al’s Phase II trial,25 however, did assess patients’ perceptions of their OIC symptoms and quality of life on naloxegol. Webster et al25 used three common, validated questionnaires to assess patients’ perspectives: the Patient Assessment of Constipation-Symptom Questionnaire (PAC-SYM), qualifying abdominal, rectal, and stool symptoms; the Patient-Assessment of Constipation Quality of Life Questionnaire (PAC-QoL), assessing physical discomfort, worries/concerns, psychosocial discomfort, and satisfaction; and the Short Form Health Survey (SF-36), which yields an 8-scale profile of functional health and well-being scores. The study found statistically significant improvements in the aforementioned questionnaires for the group of patients taking 25 mg of naloxegol daily. These patients reported lower PAC-SYM scores for rectal symptoms, lower PAC-QoL scores for physical discomfort, and improved SF-36 scores for physical functioning, mental health, social functioning, and vitality.25 Additionally, Webster et al25 found that most adverse events (nausea, diarrhea, and abdominal pain) were mild or moderate and self-limiting in nature. Importantly, the results also suggested that patients did not alter their opioid use in order to relieve bowel symptoms as no statistically significant change in opioid usage was seen in patients taking naloxegol. In their Phase III clinical trial of naloxegol, Webster et al23 also assessed patients’ use of rescue medication (bisacodyl) for those patients randomized to treatment with naloxegol at month 1, months 1–3, months 3–6, months 6–9, and months 9–12. Use of rescue medication was considered part of the usual care arm and was not tracked. Bisacodyl use for rescue among naloxegol users was low – median use was 1.1 mg per week during the first month and no use for the remainder of the 52-week study period. This suggests that naloxegol alone was sufficient for acceptable bowel function among the opioid users studied. Personal judgment of constipation based on the previous 7 days. In the US, naloxegol is only currently approved for use in noncancer patients with OIC. In the European Union, however, it is approved for any patient with OIC and an inadequate response to treatment with more than one laxative for at least 4 days in the previous 2 weeks.19 Additional investigation is needed to establish naloxegol’s efficacy, safety, and tolerability specifically in cancer patients on chronic opioid therapy. OIC is a burdensome problem for patients on chronic opioids, negatively affecting their quality of life and increasing health care costs. Traditional treatments for functional constipation often have insufficient efficacy in OIC. Naloxegol is a once-daily, oral PAMORA specifically designed to address the unique pathophysiology of OIC by inhibiting mu-opioid-receptor binding in the GI tract without reversing CNS-mediated pain relief. Clinical experience is limited, but efficacy and safety studies in patients with noncancer pain suggest a daily dose of 25 mg naloxegol is clinically effective and generally well-tolerated. Patients on naloxegol experienced improved quality of life, adherence to opioid therapy, and reduced reliance on other laxatives for regular bowel function. Naloxegol use led to statistically significant lower levels of physical discomfort as well as statistically significant improvement in physical functioning, mental health, social functioning, and vitality. There were no statistically significant changes in opioid use for patients on naloxegol, suggesting that patients did not need to alter their opioid use to relieve constipation symptoms, nor did they experience any withdrawal symptoms. Finally, studies showed a low use of rescue medication use by patients on naloxegol, suggesting that naloxegol alone was sufficient for acceptable bowel function among opioid users studied. These data, however, are currently limited to patients with nonmalignant pain, but future investigations seek to study the use of naloxegol in cancer patients with OIC. Poulsen JL, Brock C, Olesen AE, Nilsson M, Drewes AM. Clinical potential of naloxegol in the management of opioid-induced bowel dysfunction. Clin Exp Gastroenterol. 2014;7:345–358. Kumar L, Barker C, Emmanuel A. Opioid-induced constipation: pathophysiology, clinical consequences, and management. Gastroenterol Res Pract. 2014;2014:1–6. Tack J, Corsetti M. Naloxegol for the treatment of opioid-induced constipation. Expert Rev Gastroenterol Hepatol. 2014;8(8):855–861. Camilleri M, Drossman G, Webster LR, Davies AN, Mawe GM. Emerging treatment in neurogastroenterology: a multidisciplinary working group consensus statement on opioid-induced constipation. Neurogastroenterol Motil. 2014;26:1386–1395. Gaertner J, Siemens W, Camilleri M, et al. Definitions and outcome measures of clinical trials regarding opioid-induced constipation: a systematic review. J Clin Gastroenterol. 2015;49(1):9–16. Davis M, Gamier P. New options in constipation management. Curr Oncol Rep. 2015;17:55. Argoff CE, Brennan MJ, Camilleri M, et al. Consensus recommendations of initiating prescription therapies for opioid-induced constipation. Pain Med. 2015;16:2324–2337. Coyne KS, LoCasale RJ, Datto CJ, Sexton CC, Yeoman K, Tack J. Opioid-induced constipation in patients with chronic noncancer pain in the USA, Canada, Germany and the UK: descriptive analysis of baseline patient-reported outcomes and retrospective chart review. Clinicoecon Outcomes Res. 2014;6:269–281. Abramowitz L, Béziaud N, Caussé C, Chuberre B, Allaert F, Perrot S. Further validation of the psychometric properties of the bowel function index for evaluating opioid-induced constipation (OIC). J Med Econ. 2013;16(12):1423–1441. Bell T, Panchal S, Miaskowski C, Bolge S, Milanova T, Williamson R. The prevalence, severity, and impact of opioid-induced bowel dysfunction: results of a US and European patient survey. Pain Med. 2009;10(1):35–42. Olesen A, Drewes A. Validated tools for evaluating opioid-induced bowel dysfunction. Adv Ther. 2011;28(4):279–294. Gupta S, Patel J, Scopel J, Mody R. Impact of constipation on opioid therapy management among long-term opioid users, based on a patient survey. J Opioid Manag. 2015;11(4):325–338. Hjalte F, Berggren A, Bergendahl H, Hjortsberg C. The direct and indirect costs of opioid-induced constipation. J Pain Symptom Manage. 2010;40(5):696–703. Tarumi Y, Wilson MP, Szafran O, Spooner GR. Randomized, double-blind, placebo-controlled trial of oral docusate in the management of constipation in hospice patients. J Pain Symptom Manage. 2013;45(1):2–13. Candy B, Jones L, Goodman ML, Drake R, Tookman A. Laxatives or methylnaltrexone for the management of constipation in palliative care patients. Cochrane Database Syst Rev. 2011;(1):CD003448. Ahmedzai SH, Leppart W, Janecki M, et al. Long-term safety and efficacy of oxycodone/naloxone prolonged-release tablets in patients with moderate-to-severe chronic cancer pain. Support Care Cancer. 2015;23:823–830. Thomas J, Karver S, Cooney GA, et al. Methylnaltrexone for opioid-induced constipation in advanced illness. N Engl J Med. 2008;358(22):2332–2343. Entereg (alvimopan) [package insert]. Lexington, MA: Cubist Pharmaceuticals, Inc.; 2013. Movantik™ (naloxegol) tablets [package insert]. Product information. Wilmington, DE: AstraZeneca Pharmaceuticals LP; September 2014. Eldon MA, Song D, Neumann TA, et al. NKTR-118 (oral PEG-naloxol), a PEGylated derivative of naloxone: demonstration of selective peripheral opioid antagonism after oral administration in preclinical models. Poster presented at: 18th Annual Clinical Meeting of the American Academy of Pain Management; September 27–30, 2007; Las Vegas, NV. Bui K, She F, Sostek M. The effects of renal impairment on the pharmacokinetics, safety, and tolerability of naloxegol. J Clin Pharmacol. 2014;54(12):1375–1382. Chey WD, Webster L, Sostek M, Lappalainen J, Barker PN, Tack J. Naloxegol for opioid-induced constipation in patients with noncancer pain. N Engl J Med. 2014;370(25):2387–2396. Webster L, Chey WD, Tack J, Lappalainen J, Diva U, Sostek M. Randomised clinical trial: the long-term safety and tolerability of naloxegol in patients with pain and opioid-induced constipation. Aliment Pharmacol Ther. 2014;40(7):771–779. Gottfridsson C, Carlson G, Lappalainen J, Sostek M. Evaluation of the effect of Naloxegol on cardiac repolarization: a randomized, placebo- and positive-controlled crossover thorough QT/QTc study in healthy volunteers. Clin Ther. 2013;35(12):1876–1883. Webster L, Dhar S, Eldon M, Masouka L, Lappaliainin J, Sostek M. A Phase 2, double-blind, randomized, placebo-controlled, dose-escalation study to evaluate the efficacy, safety, and tolerability of naloxegol in patient with opioid-induced constipation. Pain. 2013;154:1542–1550. Holzer P. Naloxegol increases frequency of bowel movements and combats inadequate response to laxatives. Evid Based Med. 2015;20(1):5. Bui K, She F, Sostek M. The effects of mild or moderate hepatic impairment on the pharmacokinetics, safety, and tolerability of naloxegol. J Clin Pharmacol. 2014;54(12):1368–1374. Bruner HC, Atayee RS, Edmonds KP, Buckholz GT.Clinical utility of naloxegol in the treatment of opioid-induced constipation. J Pain Res. 2015;8:289–294.